“Ridiculed because of his enormous ears, a young circus elephant is assisted by a mouse to achieve his full potential.” You’ve heard of Dumbo the Elephant (if you haven’t, you are missing out! ), but have you heard of Dumbo the Octopod? 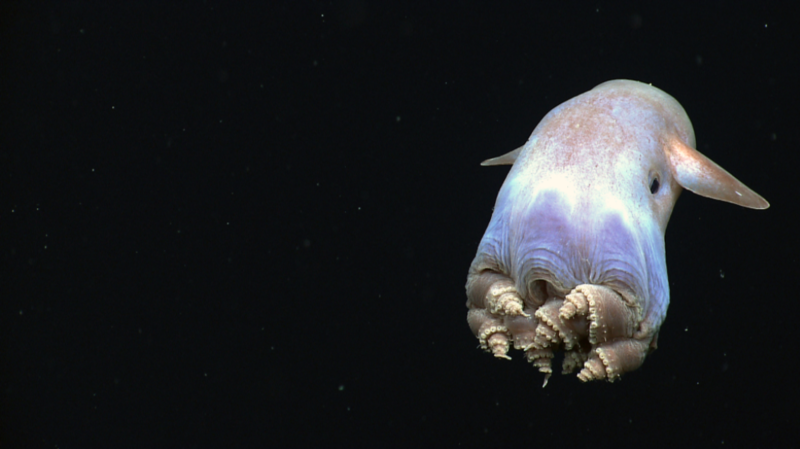 In a report in Current Biology on February 19, researchers have described a deep sea “dumbo” octopod. These young octopods look and act much like adults from the moment they emerge from an egg capsule. “Once the fins were observed while it was still in the bucket, it was clear that it was a ‘dumbo’ octopod,” says Elizabeth Shea at the Delaware Museum of Natural History. 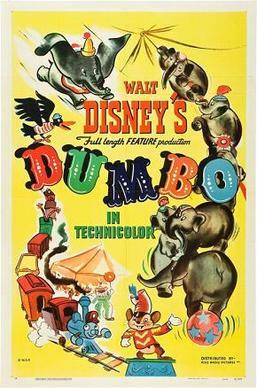 Original theatrical release poster for Dumbo (1941). WIkimedia Commons. The octopod was identified as a member of the Grimpoteuthis family. However, the researchers were unable to identify the species, because species descriptions are typically based on mature adult specimens, often including features that are likely to change as an individual grows and matures. Study co-author Tim Shank at Woods Hole Oceanographic Institution in Woods Hole, MA, was the first to see the hatchling in 2005 while serving as co-chief scientist of a Deep Atlantic Stepping Stones cruise. When Tim first took the coral out of the collection box, he placed it in a 5-gallon bucket in the cold room, and noticed that the egg case was tan-brown with a stippled texture. Initially, the egg case was not broken, but by the time he got the bucket out of the cold room and inspected the egg case, it was open and part of the hatchling was partially exposed. To begin with, the hatchling wasn’t moving much at all. However after slowly emerging from the egg case, and being brought into the lab, the hatchling swam for about 10 minutes. Magnetic resonance imaging (MRI) was employed to to explore the hatchling’s anatomy, and the researchers deduced that the specimen belonged to the genus Grimpoteuthis. The fact that hatchlings are fully formed from the start is evident from the observed behaviour and advanced state of organ development of the baby octopod. These hatchlings emerge with all the features required for fin swimming, visually and chemically sensing their environments, and capturing prey. An internal yolk sac gives the hatchlings a little time to successfully capture a first meal. The researchers say these findings can now be used in visual explorations of the deep sea, as well as in physical explorations of museum collections.